We’ve all been kids. We learned how to crawl, then walk, rather wobbly. Our talk started with jabbering, became word formations and, with hand gestures and facial expressions, we let those around us know what we had on our minds. We learned how to play: we ran, we jumped, we skipped, and we danced, threw stones into puddles and created castles in the sand. We chased our friends and laughingly embraced them when caught. We played hide-and- seek and kick-the-can and catch one, catch all. When we went to a park, we always looked for a playground. There, we lifted ourselves, or mom did, into the leather straps connected to chains on swing sets. First, we were lovingly pushed; later, we daringly thrust our legs out into the air and pumped as hard as we could so our swing would take us high into the sky. What a thrill it was. On the slides, we’d scramble up the ladders to the tops of angled metal thoroughfares, which descended in a broad curve as we sped on our hind ends back to the ground. Sometimes, if we were really courageous, we’d even go down backwards. We’d run alongside the whirling merry-go-ground and jump on the rapidly spinning disc when we saw an opening. We’d hop into sand boxes, run the tiny kernels through our fingers, and, perhaps, build our own private volcano. Some of our children are confined to wheelchairs; many suffer from autism, have limited vision or hearing, brain or epilepsy disorders, or limb movement shortcomings. These are our “mentally and physically challenged” young citizens, and their numbers are growing. Shouldn’t they, too, have the same opportunities for play that we did? Shouldn’t they be able to romp in playgrounds with other kids? Well, they can, and soon will in our own favorite “town by the tide” - San Clemente. Courtney’s Sandcastle is the brainchild of Christina Smith and her friend Lori Shelton-Jenks. Christina’s daughter, Courtney Faye Smith, six, is confined to a wheelchair due to a rare degenerative muscular disease, Spinal Muscular Atrophy. “We were looking for a playground in which Courtney and my son, Spencer, seven, who has no disabilities, could play together,” Shelton-Jenks reminisced. They visited the recently built Shane’s Inspiration in Los Angeles. There, they found play apparatus both the children could use, access to everything via wheelchair, slides with ramps rather than ladders, swings with large plastic backs to hold physically impaired bodies. 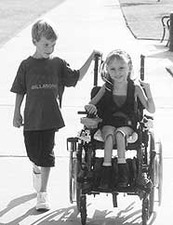 Both abled and disabled kids frolicked actively together in a playland only they could interpret and appreciate. “Why can’t we have a park like this in Orange County?” the women conspired. Further investigation brought them piles of information and ample advice. They visited other playgrounds. They spoke to municipal park representatives, political figures, and experts on issues of exercise for the disabled. 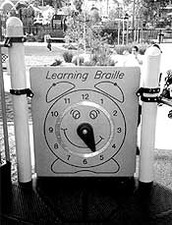 They studied catalogs and pictures of play apparatus manufacturing companies and parks that served disabled children. The greatest receptivity to their idea came from San Clemente. Mina Santoro volunteered the Junior Woman’s Club as a local sponsor; Bruce Wegner, Director of the Beaches, Parks, and Recreation Department and his staff became advocates; and representatives of the Capistrano Unified School District encouraged them. A tot lot, comprised of sections for two to five-year-olds and six to twelve-year-olds, 10,000 square feet, had previously been approved to the tune of $200,000 by the City Council as part of the new complex, including girl’s softball and practice fields, at Richard T. Steed Memorial Park. Approached with the idea of naming the tot lot Courtney’s Sandcastle and a commitment by a number of San Clemente organizations to raise an additional $200,000, the Council Okayed the creation of a “boundless playground,” which would have access by both uninhibited and handicapped children. The park is scheduled to be completed by December 2004. Shane’s Inspiration, the model for Courtney’s Sandcastle, opened in September 2000. Scott and Catherine Curry Williams, whose son suffered from the same disease as Courtney, had passed away within weeks of his birth. The Williams, in tribute to their son’s brief life, conceived of a playground, which Shane, as well other children with disabilities and non-disabled children, might have enjoyed. They devoted themselves, and attracted other supporters, to their unique project and purpose, and succeeded in acquiring two acres in the heart of Griffith Park, near the famous zoo and merry-go-round. With the blessing of the Los Angeles City Council, a park was designed to enable children of all abilities to learn and play with one another. It’s a wonderland of wheelchair-friendly ramps, platforms, and bridges; lowered basketball hoops; raised sandboxes; specially constructed swings; imaginatively decorated freestanding walls and small structures with mirrors and windows and numbers and letters in Braille. It was Shane’s Inspiration, the first playground in the west that was “boundless,” accessible to all. The organization, having raised millions of dollars, has since assisted with 21 of their own Los Angeles-based Universally Accessible Playground projects, including “Aidan’s Place” in West Los Angeles. They’ve expanded to San Diego, Sacramento, Fort Worth, Texas, and Fort Collins, Colorado, as well as San Clemente. They are also providing expertise for playgrounds in India and Israel. 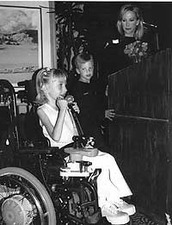 The accessible park movement began in 1998, in West Hartford, Connecticut, when Amy and Peter Barzch raised $300,000 for a playground in memory of their handicapped son, calling it Jonathan’s Dream. Its success prompted them to form Boundless Playgrounds™, an organization, which like Shane’s Inspiration, provides technical and fundraising advice to communities planning all-accessible playgrounds. Ten playgrounds rapidly followed in Maryland. Boundless Playgrounds™ hopes to help build 1,000 parks in the next five years. Their ambitious goal is to have fully integrated and universally accessible playgrounds in reach of every child. In the past several years, 40 Boundless Playgrounds™ have been completed in the U.S. and Canada; another 100 are currently in active development. The term “boundless playgrounds” has become generic, meaning no barriers to enjoying them. This national drive to create “totally open” children’s’ play areas is vital to a growing need, and it’s on its way. Over three million children under 15 in the United States have mental or physical disabilities, most denied the opportunity to play with their able-bodied friends in neighborhood playgrounds or schools. Locally, according to Karen Taylor, Communications Coordinator for Orange County’s Regional Center, almost 5,000 regional children from age zero to seventeen who have developmental disabilities are served. They include mental retardation (3,440), autism (1,688), cerebral palsy (1,046), and epilepsy (946). She’s very excited about Courtney’s Sandcastle. Explored further, playground experiences provide children with “boundless opportunities” to expand their brainpower, strength and movement and emotional and social abilities. Motor skills increase, self-confidence is regained, hand-eye coordination improves, interdependence is learned, and “taking turns” is practiced. Through playing together, children are exposed to ethnic diversity and the developmentally different. Getting along with their peers in a playground expands their socialization skills. Project Director Lori Shelton-Jenks continues to spearhead Courtney’s Sandcastle. She’s $50,000 along towards the $200,000 objective, with $130,000 to go. Individual contributions, and several fund-raisers by the San Clemente Jr. Woman’s Club, including a golf tournament, got her this far. She’s also hoping for donations for specific playground equipment with appropriate signage credit from companies, corporations, and families. Two forthcoming opportunities to participate include “Scarves and Scones,” a tea-inspired shopping experience at the St. Regis Hotel Monarch Beach Resort and Spa on May 18 sponsored by the SC Jr. Woman’s Club and the Orange District Federation of Woman’s Clubs. Call (949) 465-6700 for tickets. Also, the Ridge Trail Challenge, run-walk-bike-stroller event, sponsored by the San Clemente Friends of the Beaches, Parks, and Recreation Foundation on June 21 (web site – SanClementeEvents.com or 949-498-4585). contact Lori Shelton-Jenks (949) 366-0003.